The Long Version: It's hard to argue with success, and Apple has been so successful recently that it's turned Microsoft into an afterthought in a couple of huge markets. (Zune? WinPho7?) The mass appeal of its slick-and-shiny products is hard to deny; even in a mostly vacant mall of chain retail, the Apple Store invariably risks breaking the fire marshal's Maximum Occupancy restrictions. 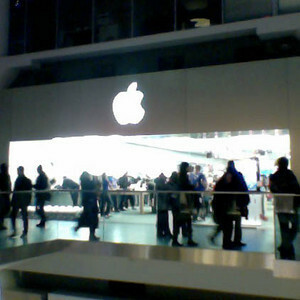 The stores' design reflects the aspirations of the company, with the current generation being even more clean and minimalist than the original "GapComputer" look. It's just unfortunate that this is far better in theory than in practice. During slow times there's actually a chance of getting attention from the twenty-plus staff who are on the sales floor at any one time. They're helpful and fairly knowledgable, and the way they use wireless electronic payment terminals means that the whole transaction can happen without anything as unstylish as a cash register. Very slick. But without their time and attention, as a customer there's not much you can do. I'm not a shopper, I'm a buyer. I like to walk into a store, find what I need, pay for it, and get out again as quickly as possible. This doesn't work in the Apple Store, because after I find what I'm looking for unaided, I'm stranded. There's no cashier, no line, nowhere to go next. Sleek and stylish turns into isolated and ineffectual. My only relief is that their system has broken down so thoroughly at the Toronto Eaton Centre location that one corner of the "Genius Bar" has become a semi-permanent cashier's desk, but there's still nothing to indicate this to the uninitiated, and people waiting to pay are intermixed with those who are waiting for an opening for tech support. What really made Apple different way back then – I've been owning and using Apple computers since the mid-80's – is the idea that if the person can't get the computer to do something, it's the computer that's at fault, not the person. So why is it that when I go into an Apple retail store, I often leave frustrated and feeling that I must be an idiot for shopping there? Internet shopping was invented for people who want to shop without the whole human interaction thing, but my recent experience with the online store was no better. 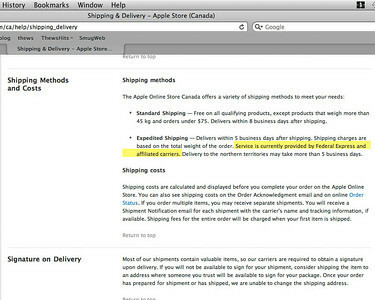 When making an online-only Apple purchase – which I've used to create this whole review – I saw that expedited shipping would cost only a modest amount more than the standard service. I checked their shipping policies, where it clearly says that shipping for Canada (and the US) is handled by FedEx. Seventeen dollars for FedEx is a non-decision, so I went ahead with it. Sure enough, when I get the tracking information sent to me six hours later, it's an unmistakable number from UPS. For reasons varied, personal, and deeply entrenched, I would happy pay an extra seventeen dollars to have something not ship with UPS. So I looked for the customer support e-mail address to vent a little tiny bit, and the only contact option turns out to be a toll-free phone number. That's not the same thing at all: if I'm going to take the time to register a complaint that's not going to go anywhere, I'd really prefer to put it in writing. While I like Apple's products, I'm not nearly convinced that they're the best place to buy their own products from. When I have a choice, the local non-branded computer store and the big-box store are both higher on my list of places to shop. There's something to be said for supporting the people who are easier to deal with, even if their stores aren't as pretty. Weird how they have a designated person by the entrance of the store to greet people as they walk in when they don't have as nearly as enough sales people on floor, isn't it? I must say I've had similar experiences: standing around, looking for a blue shirt (or whatever colour their shirts are for the season) for longer amount of time than the time spent buying the actual item. They have the technology to make things easier and quicker, just not enough people to actually use them.